Wedding? Graduation party? Bridal shower? Baby Shower? Birthday Party or other event coming up?? 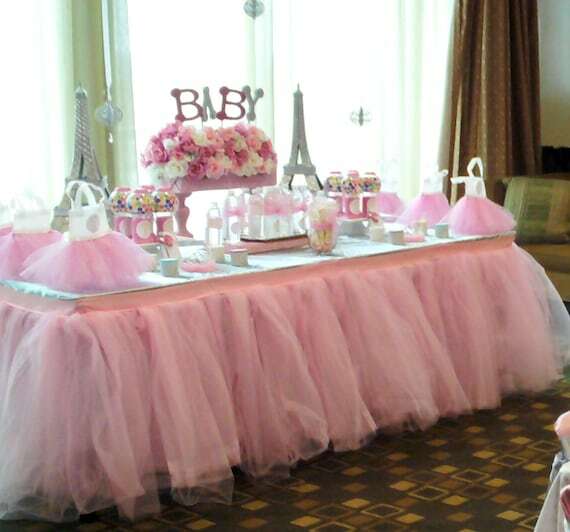 Tutu table skirts are the perfect finishing touch to any table. These skirts can be made in any color combination or even layer colors on top of each other for a fun two tone look. Each skirt is made of high quality tulle sewn onto coordinating ribbon and can be as many colors as you choose! Skirts can be attached to any shape table, they stay best with table skirt clips but can also be attached with straight pins, safety pins or Velcro. Please write tulle color, ribbon color and date of event in notes to seller at checkout! if you need a color that is not listed please ask and I will see what I can do for you!